He continued his talk exploring the transformation areas such as Operational, Eco-System, and Industry Transformation. Highlighting on how Uber has changed the car booking industry as an example in the eco-system transformation, Sunder cited Tesla Motors and Alibaba as examples for industry transformation. Salil Kallianpur from GSK-Global started his discussion with a rational statement – “Nobody trusts our industry, why would they do in this digital medium when the customer is so evolved today.” His talk focused on how digital could be used to bring in patient centricity. “Let’s make data our currency and build a patient centric environment through digital so that people start trusting in our business,” he said in conclusion. When Sagar Pawar from PwC came on to the dais, he was upfront in stating that most of his thoughts have already been covered. He focused specifically on digital trends in Pharma. Data and mobile again formed the core points of his talk. “Home care medication is going to be big in India,” he said. “m-health or mobile will change the way treatment will happen and the way information will flow and be collected.” Thereafter he shared some examples of mobile apps that are curating data effectively. However, Sagar also emphasized that we need to understand what can work in India. “We can’t pick up US models just because it has worked there. We need to understand Indian doctors, patients and the regulated industry we work in here.” He continued with some case studies about Volini, Pfizer, among others. Finally, he shared the six key trends in India that are expected to aid the uptake of the tech based health initiatives: 1. Rising middle class, 2. Instant access, 3. Inaccessibility of care, 4. Changing disease pattern, 5. Second opinion, and 6. Reliance on quacks. Dinesh Chindarkar, Co-founder at MediaMedic was the last speaker for the day but he didn’t disappoint at all with his ammo of case studies, after setting the stage on how PR in pharma has evolved to Digital PR in pharma. He also informed that there are issues that people are comfortable to talk about on the internet than to their neighbour. Giving the example of Progeria Research Foundation, Dinesh showcased how content marketing is crucial for digital marketing and Pharma should adopt. Before ending he summarized with these following tips: 1. Content and Context, 2. Storytelling, 3. Infographics, 4. Video, 5. Proactive Listening, and 6. Analytics. 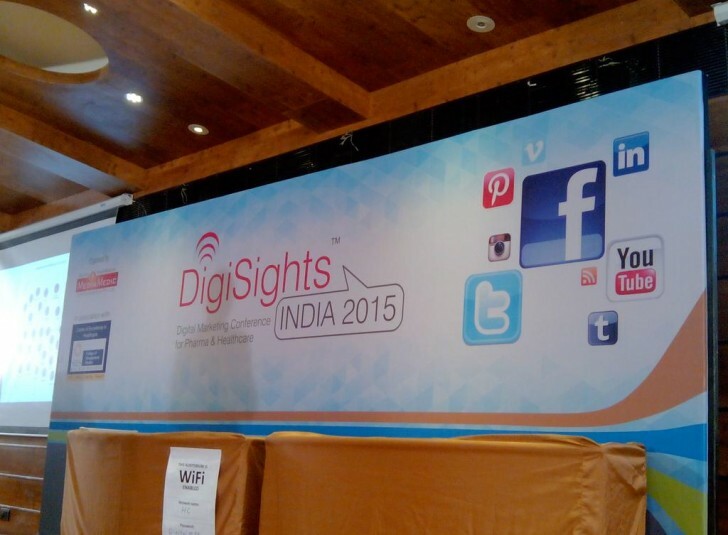 The end of his insightful talk also meant the end of the second edition of #DigiSights 2015. The house was opened for tea, cookies and the much needed networking!